Using a stove with a back-boiler as part of a central heating system. The diagram below shows a typical layout for a central heating system. It is important that there is a heat sink (such as a radiator or hot water tank) next in line from the stove and above the stove. 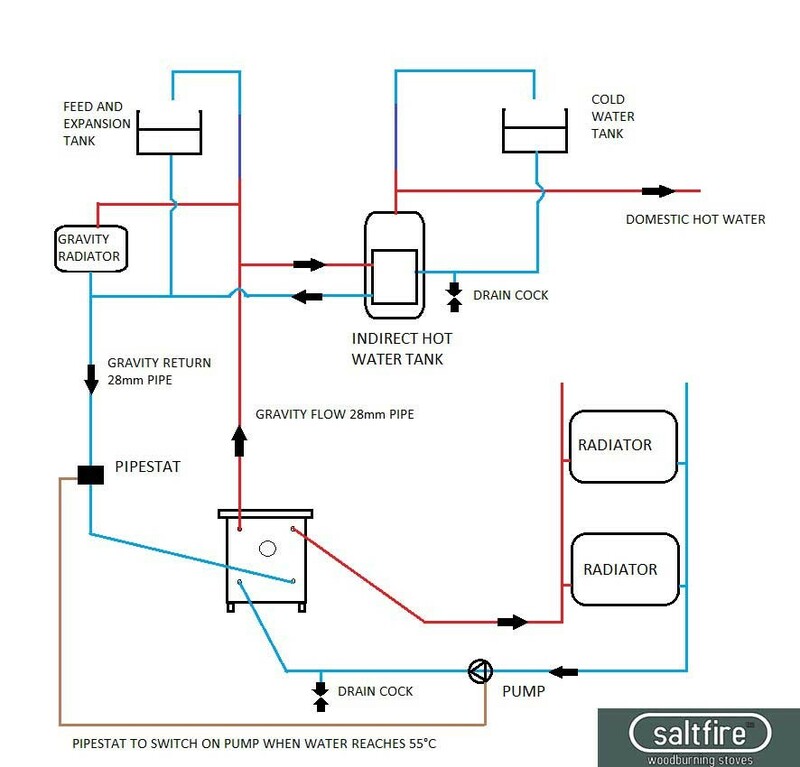 In the picture below you will see there are two circuits – one gravity fed circuit leading to the hot water tank (the first heat sink) and one pumped circuit for the radiators. This means that even if the pump fails the heat from the stove boiler can still dissipate into the hot water tank. There is a pipe thermostat fitted to the hot water circuit set to 55°C. So the pump for the radiator circuit only comes on once the hot water circuit has reached 55°. The diagram is for illustration only and should not be followed as the actual design for your installation. A boiler stove must be installed by a competant person, if unsure seek the advice of a local plumber or HETAS engineer qualified to install wet systems.